You get a Tattoo, You get a Tattoo, Everybody gets a Tattoo! 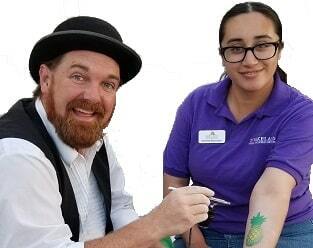 Let your guests get creative with some airbrushed tattoos and body art! A quicker, less complex alternative to our Premium Facepainting - Our Airbrush Tattoos artists can accomodate guests in about 1/3 the time! Choose a graphic from our wide selection of tattoos and get "inked" in about 1 minute! Perfect for events of with a large amount of guests or with a small event time, our Airbrush Artists do great at school carnivals, corporate picnics and festivals.